This word is mentioned only once in the Old Testament, namely, Ezek. xxvii. 15, where it is stated that the Arabian merchant people, the Dedanites (see Dodanim), brought horns of ebony to Tyre. The genuine ebony is the wood of the Diospyros Ebenum and of several kindred species. It is now indigenous to eastern Asia and Ceylon, but is found in Zanzibar and Mozambique also. In ancient times ebony was brought from Ethiopia; and this variety, which was considered superior to that of India, was held to be very precious. The Phenicians, Egyptians (Thebes; see "Zeit. 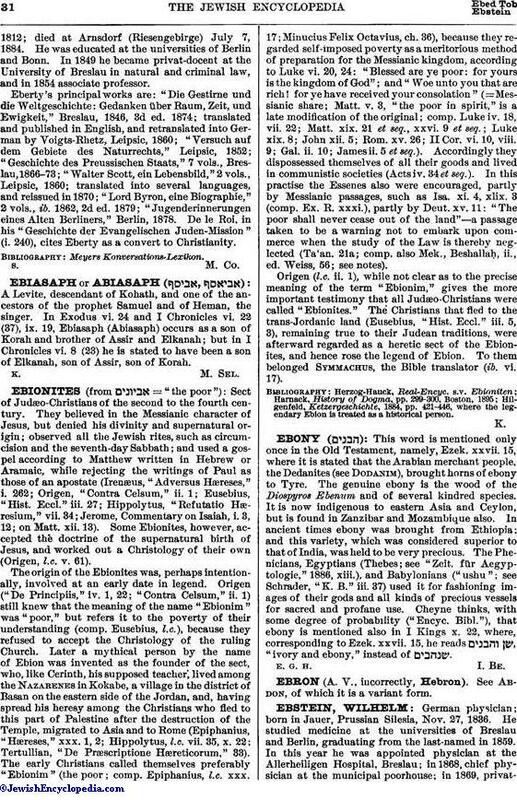 für Aegyptologie," 1886, xiii. ), and Babylonians ("ushu"; see Schrader, "K. B." iii. 37) used it for fashioning images of their gods and all kinds of precious vessels for sacred and profane use. Cheyne thinks, with some degree of probability ("Encyc. Bibl. "), that ebony is mentioned also in I Kings x. 22, where, corresponding to Ezek. xxvii. 15, he reads , "ivory and ebony," instead of .